Broomstick lace, also known as "jiffy lace" because of how quickly it forms the fabric, is a crochet technique worked with a crochet hook and a large knitting needle that mimics a broom handle. A size 50 (25mm) needle is commonly used, but you can also use a size 35, 19 or 17 knitting needle for slightly smaller broomstick lace loops. The broomstick lace pattern starts with a base crochet chain. The chain length is determined by the size of the fabric you're constructing. Chains are made in multiples of three, four or five to correspond to the number of loops in the broomstick lace stitch you plan to make. Add one more chain if you want to work a row of single crochet before you start the broomstick lace stitch, or add two more chains if you want to work a double crochet row first. When you go to work the broomstick lace stitch, however, you need to have a number of stitches that is evenly divisible by the number of loops you'll have in each broomstick lace stitch. Broomstick lace is created in a two-row process. 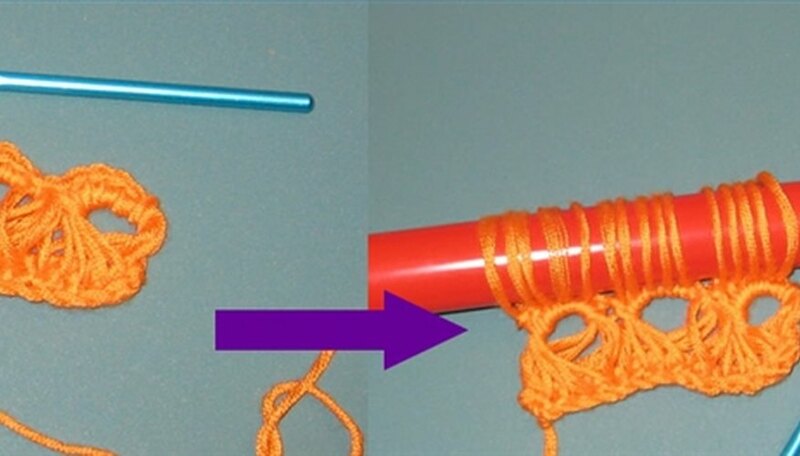 Transfer the loop from your crochet hook to the knitting needle after you've made your chain or last crochet row. Then insert the crochet hook into each chain or stitch starting with the one closest to the needle. Pull up a long loop of yarn through the stitch, and place it on the needle. Do this across the row and you'll end up with one loop on the needle for every crochet stitch on your base row. It's a good idea to count when you come to the end to make sure you didn't miss any stitches. Now you will work the loops off the needle in groups of three, four or five, depending on how you want your broomstick lace to look. The more loops you group together, the thicker the stitch will be. 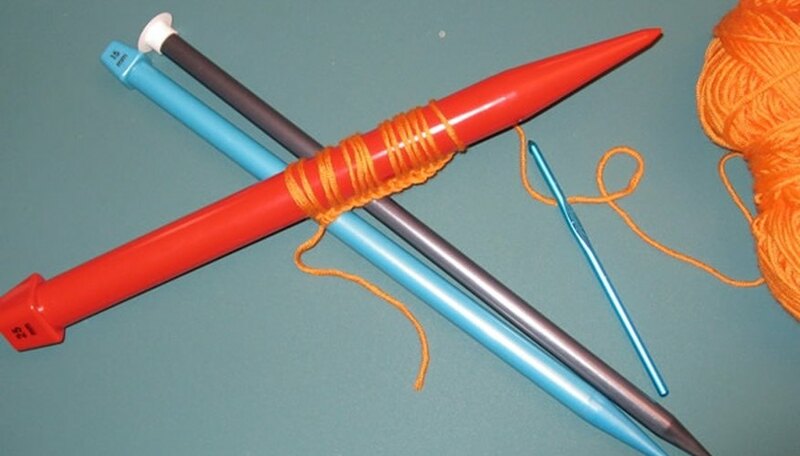 Insert the crochet hook under a group of loops from right to left. You may find it easier to remove the needle and work with the loops loose. Don't worry, they won't unravel unless you pull on the yarn at the start of the row. 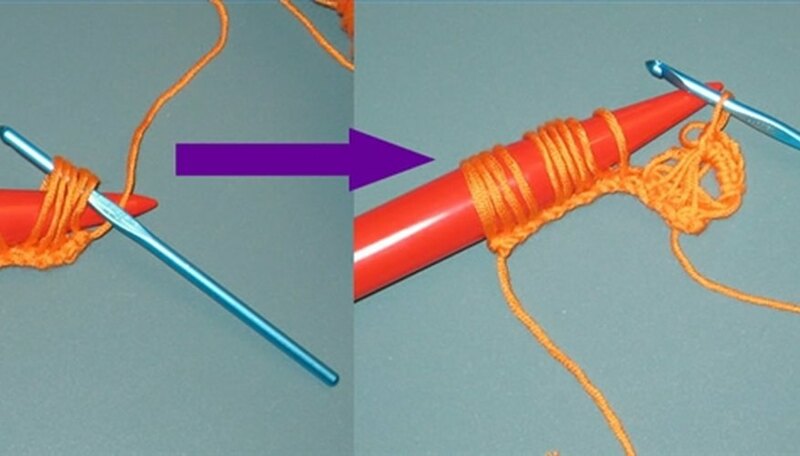 When the crochet hook is through the group of loops from the needle, yarn over and pull up a loop, then chain one to join the loops into a cluster. Single crochet into the group of loops, making one stitch for each loop in the cluster. Repeat this process across the row. If you did the calculations correctly when determining your chain length, you will end evenly, with no leftover loops. One section of broomstick lace is now complete. To continue working in the pattern, transfer the single loop on the crochet hook to the knitting needle and pull up a loop in each single crochet stitch across the row as you did with the base row before. The reason you single crocheted into the loop clusters once for each loop is so you'll have the same number of stitches to pull loops through in the next row. 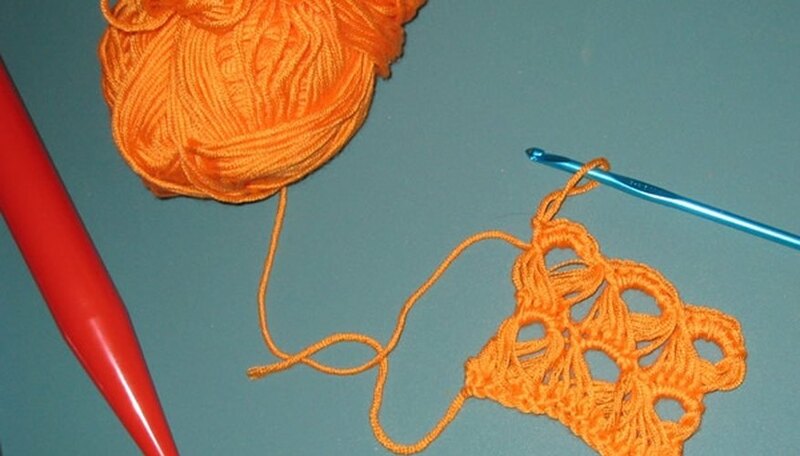 You may also notice that you never need to turn your work when making broomstick lace. The stitches are all done on the right side of the work, much like the Tunisian or afghan stitch technique.